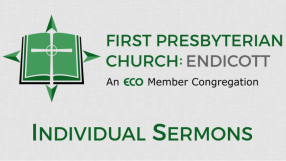 Dust in the Wind: The Unfairness of Life Part 1 1-27-19 from FPC Endicott on Vimeo. From Series: "Dust in the Wind"
At the beginning of a new year, we make all sorts of plans to improve our lives. At the end of his life, the teacher of Ecclesiastes sat back and took stock of his days. As he reflected on the mysteries, questions, and struggles in life, his conclusion was that the things we pursue are fleeting. Our own efforts are destined to be short-lived, unless we do them being mindful of God ̶ knowing Him, fearing (revering) Him, thanking Him, and enjoying every good thing as a gift from God’s hand. As we begin 2019, do you want to find meaning in life? Are you looking for purpose? Something to fill the emptiness? Something that will give you real contentment? Then let’s learn from the guy who tried it all . . . and finally found what truly satisfies. More From "Dust in the Wind"